The Eureka Police Department has identified the victim in Thursday’s fatal shooting as Rhianna McKenzie, 19, of Eureka. Police still haven’t released a motive for the slaying, but some posts to the Facebook page of the alleged killer, Maxx Carson Robison, indicate he was going through some emotional turmoil in the days leading up to the shooting. On Monday, he posted a picture of a break-up note from his girlfriend, writing that he’d woken up to find it. “I love you very much more than words can describe but I can’t watch you do this anymore or go through it,” the note reads. According to Robison’s Facebook status, the girlfriend was not the victim in Thursday’s shooting. On Tuesday, Robison posted his apologies for a live video he put up Monday, saying “I don’t condone drinking and driving. I was mentally unstable and emotionally breaking …” On Wednesday, less than 24 hours before the shooting, he posted at 4:33 a.m. “Can’t sleep due to being clean and sober anybody awake? Don’t worry I’ll still be able to work just fine mayor,” he wrote. Robison was also featured in this 2011 Journal story, which profiled a hip-hop group of which he was a member. Eureka Police have arrested a 20-year-old Eureka man on suspicion of murder in connection with the shooting of a 19-year-old Eureka woman early yesterday morning. Humboldt County jail booking sheets show Maxx Carson Robison was booked on suspicion of murder at 7:41 a.m. yesterday, less than five hours after shots rang out near the intersections of McCullens Avenue and Iowa Street in Eureka. According to EPD, officers responded to a shots fired call shortly after 3 a.m. Thursday. An officer arrived on scene just in time to see a vehicle fleeing the area at high speed. The driver refused to pull over and a pursuit ensued, ultimately ending when the vehicle pulled into the St. Joseph Hospital parking lot. Officers then learned there was a female gunshot victim inside the vehicle, and she was rushed into the hospital, where she was later pronounced dead. When officers returned to the scene of the shooting, in the 1500 block of McCullens Avenue, they found numerous shell casings. Upon further investigation, officers zeroed in on Robison, who had had been detained after being picked up by officers in an unrelated case. During the investigation, officers seized a shotgun and a “high-powered semi-automatic rifle,” and now believe the rifle was used in the shooting. 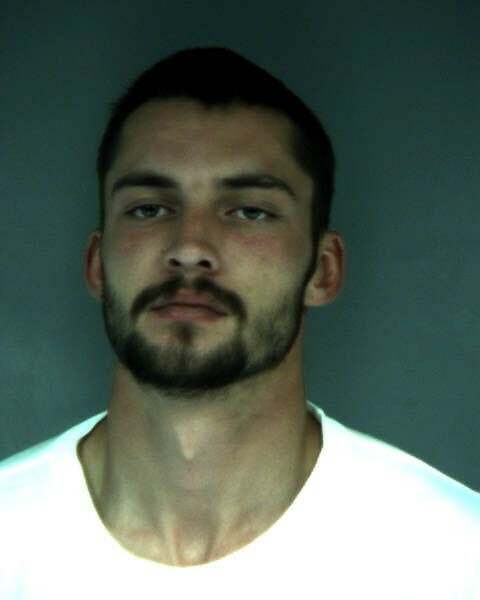 According to Humboldt County Superior Court records, Robison has no prior criminal record in Humboldt County. Police are withholding the identity of the 19-year-old until her family can be notified. EPD asks anyone with information about the shooting to call detective John Gordon at 441-4300. On June 30, 2016, at approximately 3:04 a.m., officers from the Eureka Police Department responded to reports of shots fired near the intersection of Iowa and McCullens. As the first officer arrived to investigate, he noticed a vehicle traveling at a high rate of speed with obvious gunshot damage to the body of the vehicle. The officer attempted an enforcement stop on the vehicle, but the driver failed to yield. Officers pursued the vehicle at speeds between 70 and 80 miles per hour. The pursuit ended when the vehicle pulled into the St. Joseph Hospital parking lot. Officers learned there was a female gunshot victim in the vehicle. The female was rushed into the emergency room where lifesaving efforts were initiated. The male driver of the vehicle was detained and cooperated with officers. The male stated that the incident occurred in the 1500 block of McCullens Avenue. Officers responded to that vicinity and located the crime scene. The scene was secured and detectives responded to take over the investigation. The female gunshot victim, 19 of Eureka, succumbed to her injuries. Her identity is being withheld until the next of kin are notified. While investigating the homicide, an unrelated call for service was dispatched to EPD officers. The suspect from the unrelated call was detained and taken into custody on unrelated charges. As the homicide investigation progressed, detectives discovered enough probable cause to connect this male suspect with the homicide and he was subsequently arrested for murder. The identity of the suspect will be released tomorrow. During the investigation into the homicide suspect, two firearms were located and seized. One firearm was a shotgun and the other was a high powered semi-automatic rifle. The rifle is believed to be the weapon used in the homicide. Anyone who may have witnessed any of the events that occurred early this morning are asked to contact Detective John Gordon at (707) 441-4300.